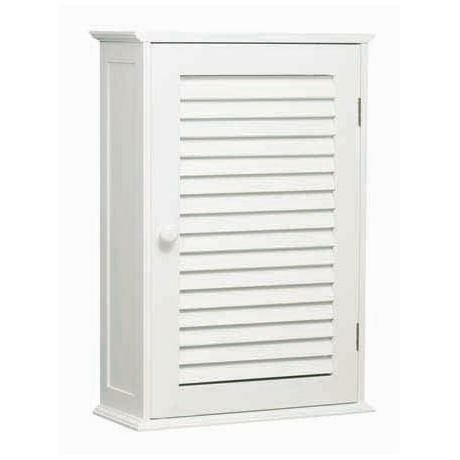 The White Wood Bathroom cabinet is a must have item for any bathroom and is easily mounted to any wall. Made from MDF with a painted white wood finish, the neutral colour will fit in with any bathroom decor. Q. Please could you tell me the internal dimensions - width, depth and height. Also what is the thickness of the wood used for the long panels on the left and the right hand sides? Hi, these measurements are unavailable from the manufacturer we can provide you with approx. sizes. The thickness is 15mm, inside width is 36cm, height is 54cm depth is 16cm. Hope this helps! Hi Sue, the shelf is fixed at approx. 30cm. Hope this helps! Q. Is it possible to mount the door on the opposite side? Hi Dave, it is possible to mount the door of the White Wood Wall Cabinet on the opposite side, however the manufacturer would not advise this, and it would affect the warranty. Thanks. Lovely cupboard. Delivered promptly.Our bathroom is fairly small and this cupboard Looks well proportioned. I am very happy with this item and it was suprisingly easy to fit together. customer service team were very helpfull in sending out a replacement part that was missing.